Just call it "Fire and Fury in a Pollinator Garden." That would be the firecracker red flameskimmer dragonfly, Libellula saturata. They fly into our pollinator garden in Vacaville, Calif., attracted by the lily-padded pond and the all-you-can-eat buffet of flying insects. They snag their prey in flight--usually a native bee or syprhid fly--and perch on a bamboo stake to eat it. Table for one, please! No, waiter, I don't need a napkin. Thank you, though. Their flight reminds us of helicopters. Firecracker red helicopters. If you've ever thought about the dragonfly being a perfect design for a helicopter, you'd be right. 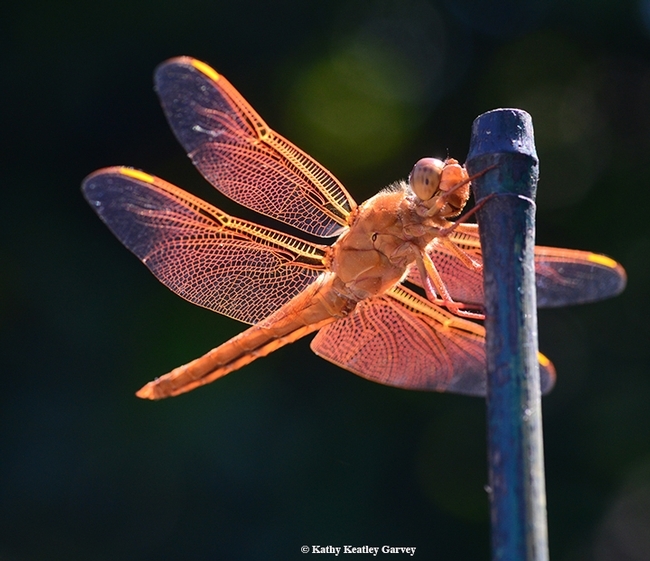 Check out the website, "Design and the Universe," for its informative piece on "The Dragonfly: The Inspiration for the Helicopter." "The wings of the dragonfly cannot be folded back on its body. In addition, the way in which the muscles for flight are used in the motion of the wings differs from the rest of insects. Because of these properties, evolutionists claim that dragonflies are "primitive insects." "In contrast, the flight system of these so-called 'primitive insects' is nothing less than a wonder of design. The world's leading helicopter manufacturer, Sikorsky, finished the design of one of their helicopters by taking the dragonfly as a model.6 IBM, which assisted Sikorsky in this project, started by putting a model of a dragonfly in a computer (IBM 3081). Two thousand special renderings were done on computer in the light of the manoeuvres of the dragonfly in air. Therefore, Sikorsky's model for transporting personnel and artillery was built upon examples derived from dragonflies." 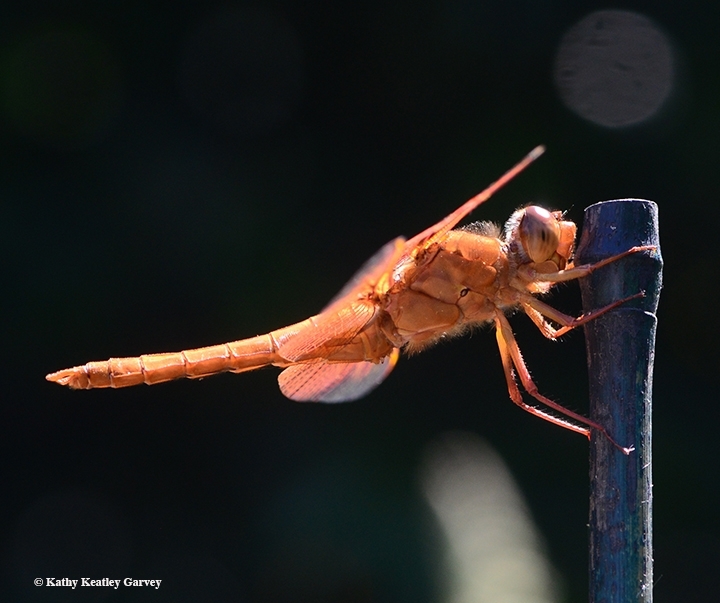 "The body of a dragonfly looks like a helical structure wrapped with metal. Two wings are cross-placed on a body that displays a colour gradation from ice blue to maroon. Because of this structure, the dragonfly is equipped with superb manoeuvrability. No matter at what speed or direction it is already moving, it can immediately stop and start flying in the opposite direction. Alternatively, it can remain suspended in air for the purpose of hunting. At that position, it can move quite swiftly towards its prey. It can accelerate up to a speed that is quite surprising for an insect: 25mph (40km/h), which would be identical to an athlete running 100 metres in the Olympics at 24.4mph (39km/h). "At this speed, it collides with its prey. The shock of the impact is quite strong. However, the armoury of the dragonfly is both very resistant and very flexible. The flexible structure of its body absorbs the impact of collision. However, the same cannot be said for its prey. The dragonfly's prey would pass out or even be killed by the impact." "Following the collision, the rear legs of dragonfly take on the role of its most lethal weapons. The legs stretch forward and capture the shocked prey, which is then swiftly dismembered and consumed by powerful jaws." 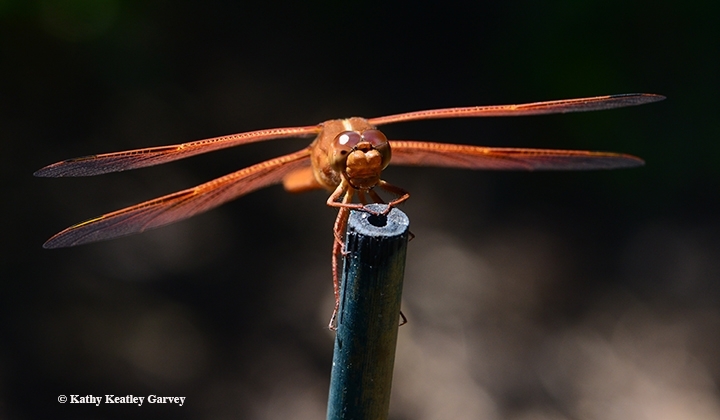 As for our little male flameskimmer, our firecracker red dragonfly, we watched him ambush prey, unleashing his special brand of fire and fury in a pollinator garden.